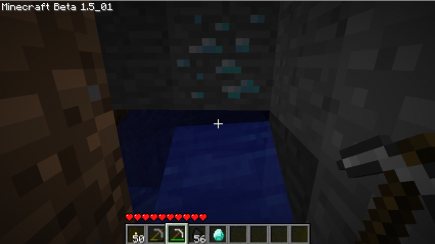 But then, as I was digging one of my branches, I found an opening beneath me, and saw water beneath. Heading down, there was a quite lovely little pool down there, with a surprising amount of ore in its ceilings! 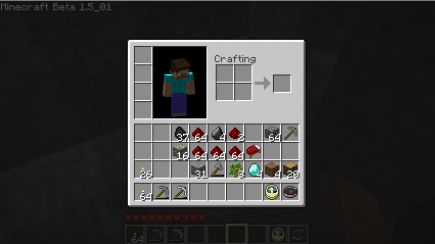 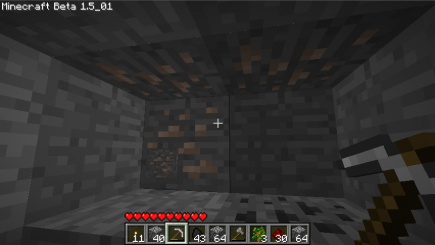 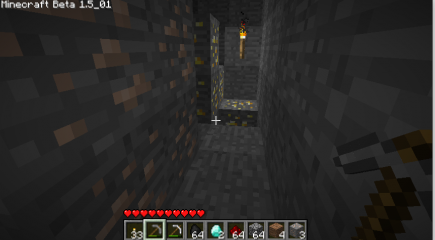 So I went down and mined out the ore that I could find, and then went back up the entrance that I came in. The thing was, though, it felt like I should be pretty much at the end of that branch, about to rejoin the central corridor; and that part of the corridor was interrupted by a lava pit! 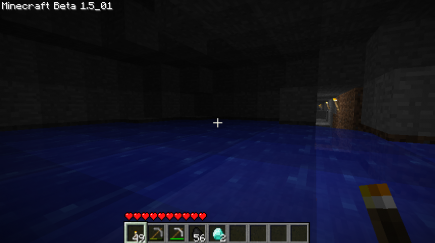 (This underwater cavern was actually beneath the lava layer, only four or five blocks above bedrock.) So I was afraid that, if I kept going, I’d accidentally set off a lava flow: in fact, I wasn’t completely convinced that I wasn’t already under lava. 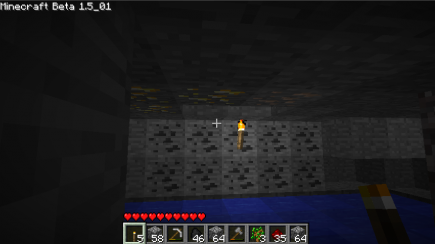 So I dug over into an adjacent branch, and carefully counted off the squares: it turns out that no, I wasn’t underneath the lava, but I was right underneath a corridor wall. 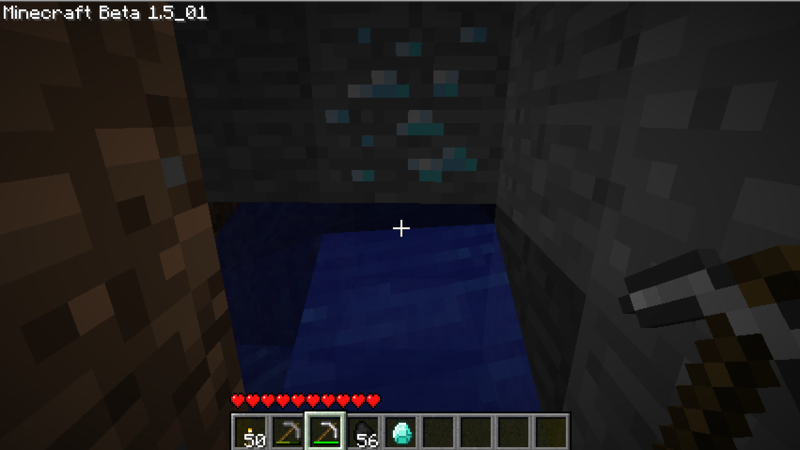 I carefully dug down there, creating a second entrance into the pool. 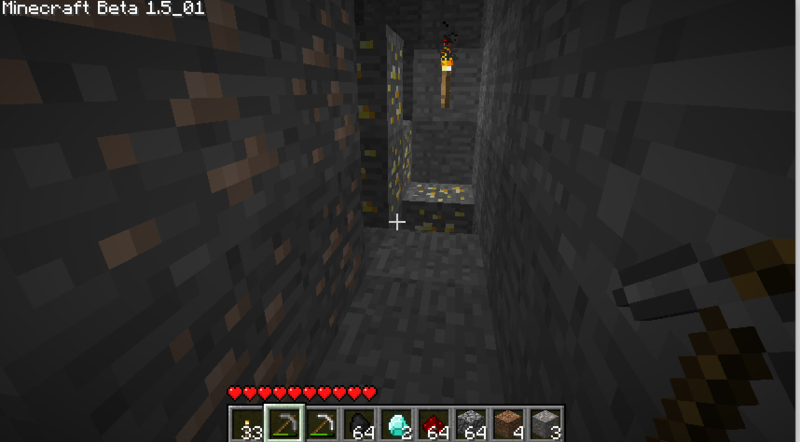 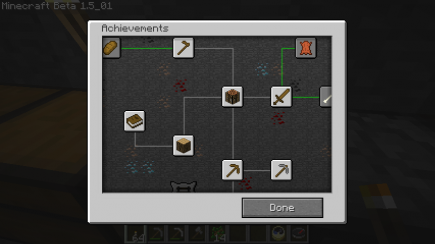 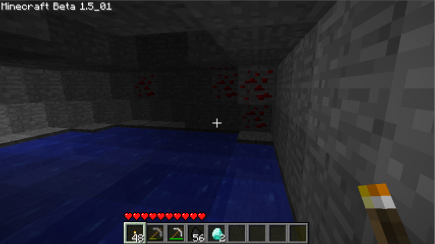 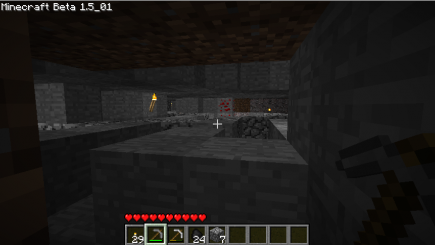 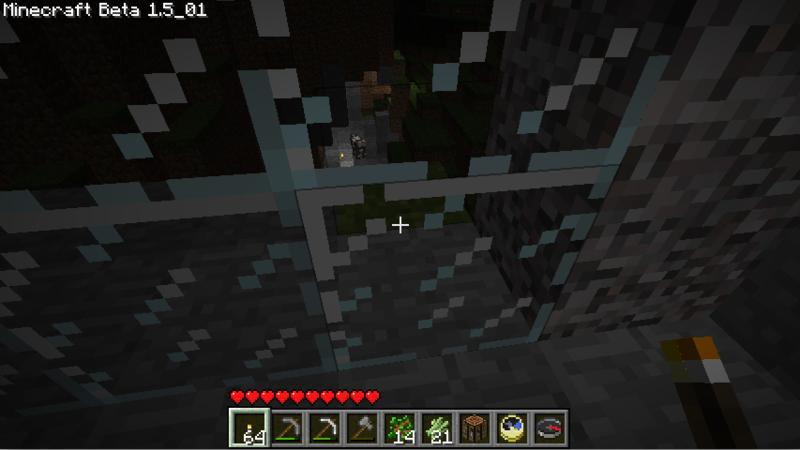 After that, I extended my main mine corridor, and ran into some ore and a couple of diamond blocks. 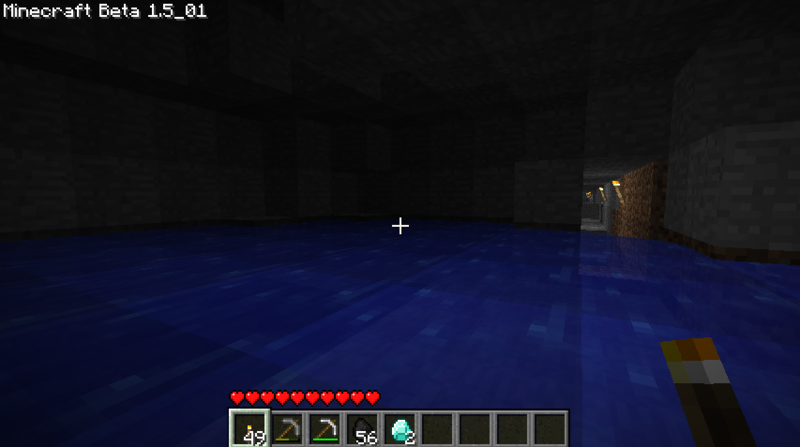 And, when I dug the bottom of those out, I ran into another suprise: more water! 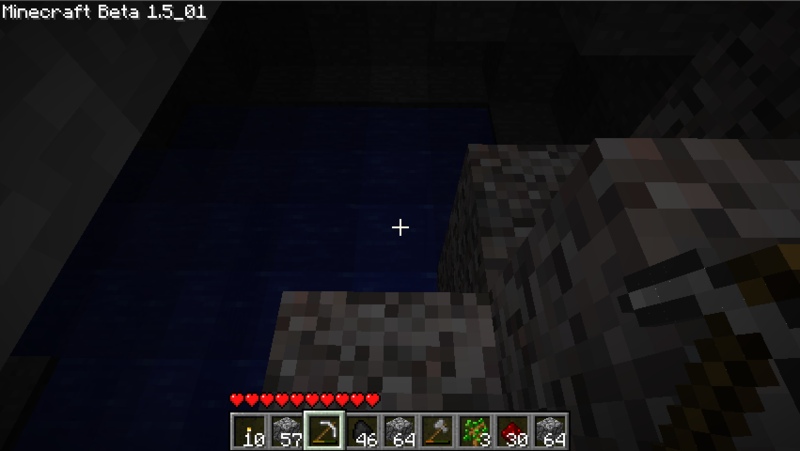 I’m not used to that much water right at or beneath the lava layer. 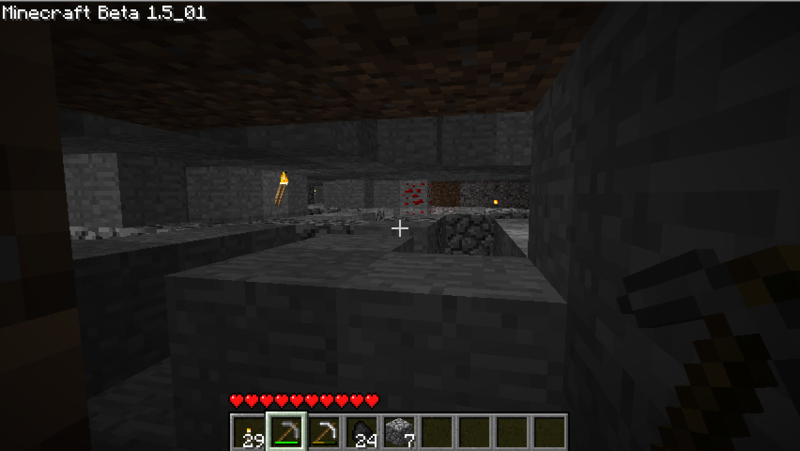 I swam up in there, and there was another quite nice pool; here’s a view from inside the pool, looking back at the main mine corridor, along with a view of some of the redstone that was in the pool walls. 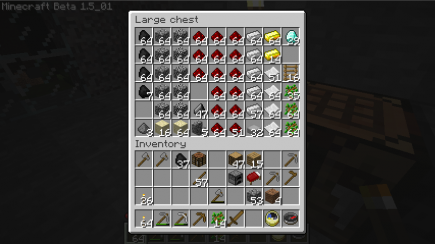 After that, I went back up to my house to smelt the ore. Here’s a picture of my current stash, along with a view of a cow in the distance through the window and the achievements that I took the time to earn. Surprising how many achievements I haven’t earned, given their small number (and it’s not that I haven’t earned them since 1.5 was released, I’ve never done them): I’d been consciously avoiding combat, but I really should give farming a try at some point.